Gums is the hardest bear to find on the second-hand market, partly as he was the first bear to be discontinued due to lack of sales. This may be due to him, unsurprisingly, having no teeth on his evil face! 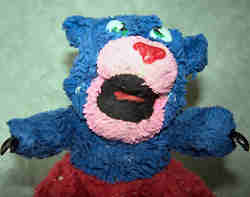 His fur is dark blue with a pink face, paws and feet. He wears red shorts, and his "nice" face wears a red and yellow night cap. His story reveals that he becomes a WereBear when he is claustrophobic - which is handy, as he is stolen and then used in a kidnapping before being stuffed into the criminal's jacket. Disturbingly, he begins sucking on the criminal's chest, before then exclaiming, "Gums likes thumbs!" and attacking the second baddie!